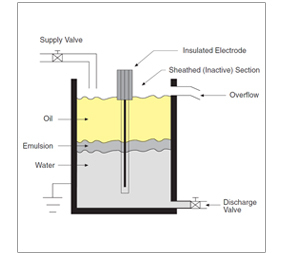 Integral to process control in many industries, level sensors fall into two main types. Point level measurement sensors are used to mark a single discrete liquid height–a preset level condition. Generally, this type of sensor functions as a high alarm, signaling an overfill condition, or as a marker for a low alarm condition. Continuous level transmitters are more sophisticated and can provide level monitoring of an entire system. They measure fluid level within a range, rather than at a one point, producing an analog output that directly correlates to the liquid level in the vessel. To create a level management system, the output signal is linked to a process control loop and to a visual indicator. These transmitters incorporate an analog signal processor, a microprocessor, binary coded decimal (BCD) range switches, and an output driver circuit. Transmit pulses and a gate signal from the microprocessor route through the analog signal processor to the sensor, which sends an ultrasonic beam to the liquid surface. The sensor detects the echo from the surface and routes it back to the microprocessor for a digital representation of the distance between the sensor and the liquid level. Through constant updating of received signals, the microprocessor calculates averaged values to measure liquid level. These level sensors are used in vessels or pipes to automatically operate pumps, solenoid valves, and high/low alarms. Two would be required to fill and empty tanks, and to meter liquid volumes. Compatible with most liquids, they are unaffected by coatings, clinging droplets, foam, and vapor. However, highly aerated liquids and liquids viscous enough to clog the sensor gap may cause problems.